The Varvakeion Athena reflects the type of the restored Athena Parthenos: Roman period, 2nd century CE (National Archaeological Museum of Athens). It was the most renowned cult image of Athens,[note 1] considered one of the greatest achievements of the most acclaimed sculptor of ancient Greece. Phidias began his work around 447 BC. [note 2] Lachares removed the gold sheets in 296 BC to pay his troops, and the bronze replacements for them were probably gilded thereafter; it was damaged by a fire about 165 BC but repaired. An account mentions it in Constantinople in the 10th century. This statue is a depiction of Athena after winning a combat. With her left hand she supports a shield with carvings of an Athenian battle against the Amazons. On her right, rests the winged Goddess of victory Nike. Her left knee is slightly bent, her weight slightly shifted to her right leg. Her peplos is cinched at the waist by a pair of serpents, whose tails entwine at the back. Locks of hair trail onto the goddess's breastplate. 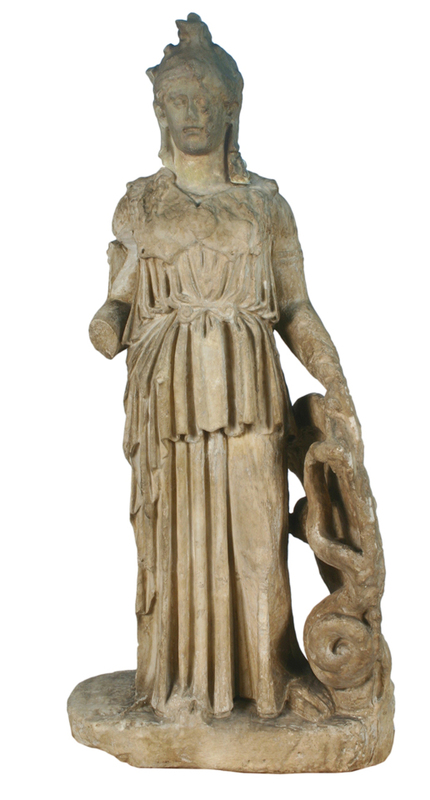 The Nike on her outstretched right hand is winged; whether there was a support under it in Phidias' original has been much discussed; evidence in surviving versions is contradictory. The exact position of Athena's spear, often omitted, is also not fully determined, whether held in the crook of Athena's right arm or supported by one of the snakes in the aegis, as N. Leipen restores it, following the "Aspasios" gem. The statue was 26 cubits (around 11.5 m (37 ft 9 in)) tall and stood on a pedestal measuring 4 by 8 metres. The sculpture was assembled on a wooden core, covered with shaped bronze plates covered in turn with removable gold plates, save for the ivory surfaces of the goddess's face and arms; the gold weighed 44 talents, the equivalent of about 1,100 kilograms (2,400 lb); the Athena Parthenos embodied a sizeable part of the treasury of Athens. A number of ancient reproductions of all or part of the statue have survived. The Varvakeion Athena, a 3rd-century CE Roman copy in marble is housed in the National Archaeological Museum of Athens. This is generally considered the most faithful version. The Lenormant Athena, a small unfinished copy, perhaps of the 1st century CE, is also in the National Museum, Athens. Another copy is in the Louvre. A 3rd-century BC copy is housed in the National Museum of Serbia in Belgrade. 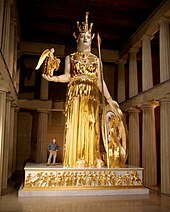 Nashville's Athena stands 41 ft 10 in (12.75 m) tall, making her the largest piece of indoor sculpture in the Western World. It stood in Nashville's Parthenon as a plain, white statue for twelve years. In 2002, Parthenon volunteers gilded Athena under the supervision of master gilder Lou Reed. The gilding project took less than four months and makes the modern statue appear that much more like the way that Phidias' Athena Parthenos would have appeared during its time. The 23.75-karat gold leaf on Nashville's Athena Parthenos weighs a total of 8.5 pounds (3.9 kg) and is one-third the thickness of tissue paper. ^ "Athena Parthenos by Phidias". Ancient History Encyclopedia. Retrieved 2017-09-28. ^ Osborne, Robin. Archaic and Classical Greek Art. p. 82. ^ "Athena Parthenos by Pheidias". Ancient History Encyclopedia. Retrieved 2017-02-24. ^ Jenkins, Ian (2007). The Parthenon Sculptures. Harvard University Press. pp. 82–82. ^ "Athena Parthenos of Belgrade". National Museum of Serbia. ^ "Athena". Metro Government of Nashville & Davidson County. Tennessee. Retrieved February 9, 2018. ^ Melton, J. Gordon; Baumann, Martin (September 21, 2010). Religions of the World: A Comprehensive Encyclopedia of Beliefs and Practices (2nd ed.). Santa Barbara, California: ABC-CLIO. p. 234. ISBN 159884203X. Bruno, Vincent J., ed. 1974. The Parthenon. New York: Norton. Cosmopoulos, Michael B., ed. 2004. The Parthenon and its sculptures. New York: Cambridge Univ. Press. Harris, Diane. 1995. The treasures of the Parthenon and Erechtheion. Oxford: Clarendon. Neils, Jenifer, ed. 1996. Worshipping Athena: Panathenaia and Parthenon. Madison: Univ. of Wisconsin Press. --. 2005. The Parthenon from Antiquity to the present. New York: Cambridge Univ. Press. Pollitt, J. J., ed. and trans. 1990. The art of ancient Greece: Sources and documents. New York: Cambridge Univ. Press.